Unlike the rest of Umbria which is a landscape of gentle rolling hills, Gubbio is situated on the steep slopes of Monte Ingino. Gothic buildings cover the sides of this mountain which is crowned by the open air funicular. The slopes become especially festive at Christmas time for they are covered with lights like a giant Christmas tree. The Eugubine tablets, the most remarkable samples of Umbrian script, were written here between the 4th century and 2nd century BC. This town was held successively by different powers: the Roman Empire, the Saracens, the Montefeltros and then the popes. In spite of its steep slopes Gubbio is easy to see as it is only small. The buses arrive at the foot of the hill in Piazza Quaranta Martiri (40 martyr square) which honours the the Gubbio inhabitants killed by Nazis for having rebelled. From here walk up the hill to Piazza Grande. Corso Garibaldi and Piazza Oderisi are on the right . There is a lift leaving Piazza del Podesta going up to the Palazzo Ducale and the cathedral. Around Piazza Grande are the most stunning buildings in the town. The Palazzo dei Consoli constructed in the 14th century was supposedly created by Gattapone. Its façade and tower are so impressive that they are visible from any corner of the town. Inside the palazzo is the Museo Civico exhibiting the bronze Eugubian tablets that were discovered in the mid 15th century. Upstairs is a pinacoteca whose collection is composed of works by the Gubbian school. The Palazzo del Podesta called Palazzo Pretorio is where the Town Hall sits today. It has a stunning vaulted ceiling which can be only be seen upon request. To reach Basilica di Sant’Ubaldo where the saint’s remains are you have to take the Funivia Colle Eletto. Not an experience for those afraid of heights, this open air funicular travels along a wire hanging over the rocky hill. Although rather terrifying it´s worth it for the incredible views. On top of the hill you´ll find the basilica, a restaurant and lovely gardens for picnicking and a lovely walk. The Museo della Ceramica a Lustro e Torre Medioevale di Porta Romana has an excellent ceramic collection with work from Arab Spain, medieval and renaissance times. The collection also features 18th century crossbows, targets and a chastity belt. On Via Federico da Montefeltro (known as Via Ducale or Via della Cattedrale) are the Palazzo Ducale commissioned by the duke of Montefeltro and modelled on the family´s palazzo in Urbino, Gubbio´s pink cathedral dating back to the 13th century with Pinturicchio’s stained glass window and fresco, and the Museo Diocesano which is next to the Palazzo Ducale and houses pieces from the Middle Ages found in Gubbio. The 13th century Gothic Chiesa di San Francesco on Piazza Quaranta Martiri is attributed to Perugian Fra Bevignate. Ottaviano Nelli created its frescoes. By the church is the convent and the Chiostro della Pace. The cloister features magnificent ancient mosaics and a tranquil garden to explore. The Palazzo del Bargello dating back to the Middle Ages was then the police station and jail. 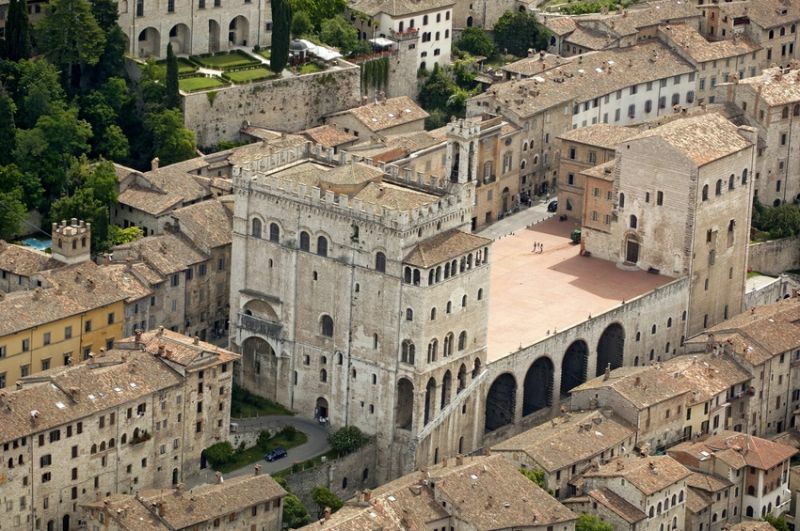 It is located in the medieval part of Gubbio. The Fountain of Lunatics is said to drive mad anyone who dares to walk around the fountain three times. It is often crowded with tourists trying to challenge the myth! The Teatro Romano is near Piazza Quaranta Martiri. It still puts on some concerts in the summer. On 15th May every year the Corsa dei Ceri (Candles Race) is held on the streets of Gubbio. The date was chosen to honour to Sant’Ubaldo, Gubibio’s patron saint. Three teams race carrying enormous candles weighing up to 400 kilograms along the streets. The Palio della Balestra is an archery competition between Sansepolcro and Gubbio. Competitors use medieval crossbows and all year round shops sell objects related to the competition. 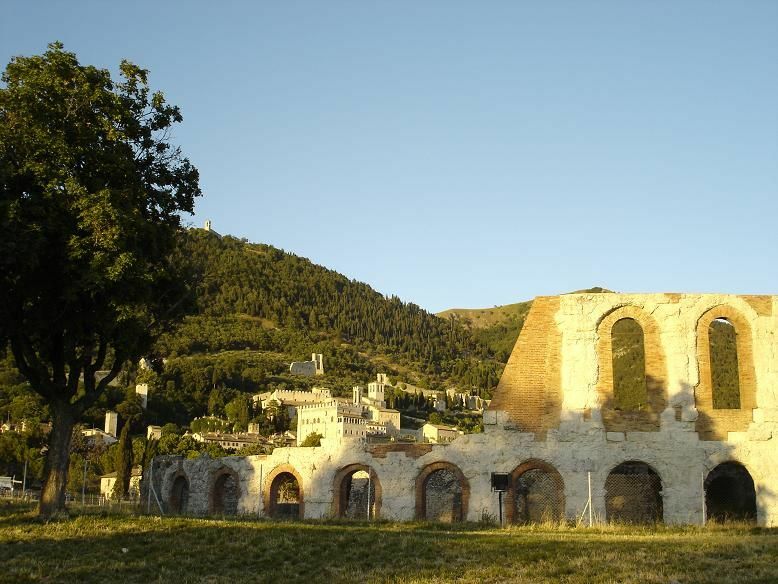 The production of ceramics in Gubbio, like in other towns in the area, was its economic resource in the Middle Ages. Today you can still purchase pieces at Leo Grilli Arte. The tourist information office is in Piazza della Repubblica. Ristorante Fabiani on Piazza Quaranta Martiri offers an inexpensive tourist menu or an a la carte menu which is a little more expensive along with fish specials on Fridays or Saturdays. Ristorante la Furnace di Mastro Giorgio was given this name in honour of the famed Gubbian ceramic artist of the Middle Ages. His oven can still be seen on one of the restaurant´s walls. Its extensive wine list includes 500 labels and it has an interesting menu with traditional dishes given an innovative touch such as the venison carpaccio with salt, olive oil and asparagus. Taverna del Lupo is named after the wolf (lupo) that saint Francis of Assisi supposedly tamed. It is said that that wolf came to this tavern to eat. It is en elegant spot serving dishes prepared with local products from the Apennines. La Madia di Giuseppe Enoteca offers wine, typical snacks and you can also purchase local products. BY BUS : to Perugia (duration: 1.10 hours, services 10 a day), to Gualdo Tadino (duration: 50 minutes, services: 10 a day), to Umbertide ( duration: 50 minutes, services: 3 a day). Piazza Quaranta Martiri is the departure point. 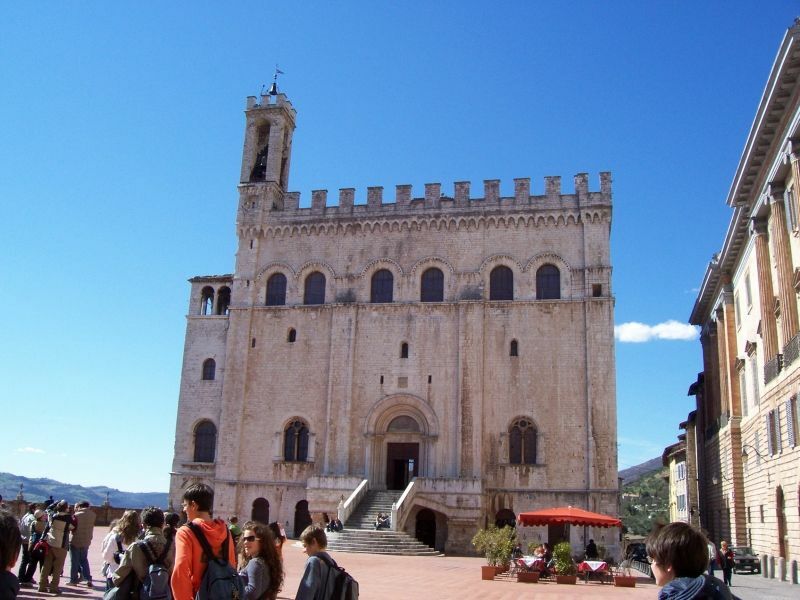 Within Gubbio there are buses from Piazza Quaranta Martiri to the funicular and main sightseeing spots. BY CAR: from Perugia drive along the SS298. From Ancona drive along the SS76. The route is fairly well signed. Piazza Quaranta Martiri has a large car park. BY TRAIN: the nearest railway station is 18 km from Gubbio in Fossato di Vico. There are buses connecting Gubbio and Fossato di Vico. To Foligno (duration:30 minutes, services: every hour).